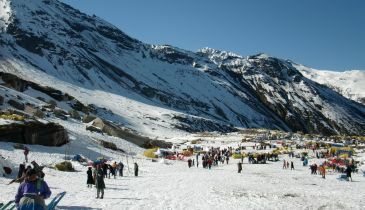 Explore the unmatched scenic grandeur of Manali, the extremely popular destination of North India in Himachal Pradesh. Pass through scenic Kullu Valley while driving to Manali. 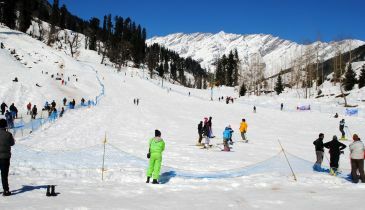 Displaying lavish natural scenery, Manali offers snow clad peaks and lovely green grasslands. The ostentatious Deodar forests and roar of gushing Beas River adds glory to the panoramic landscapes. Walk in the charming apple orchards and play in the snow slopes at Rohtang with your beloved. Book a holiday of lifetime at this Abode of Romance. Before Boarding Bus, Please Contact on the mentioned Telephone Numbers on the Tickets, as the Boarding Point & Timing are Subject to Change. Company holds No Responsibility on the Condition of the Vehicle, Behaviour of the Transport Staff and the Seat Numbers (in Bus) Allocated to the Guest. This is an Outsourced Service and we only act as Facilitator between Transport and Guest. Generally the Bus Arrives Manali at 8:00 am in the Morning. Early Check-In at the Hotel is Always Subject to Availability as the Check-In Time of the Hotels is 1400 Hours & Check-Out Time is 1000 Hours. For Early Check-In & Late Check-Out, Payments are to be settled Directly by the Guest at the Hotel. The Number of Meals including Breakfast is always corresponding to the Number of Nights Booked. Hence, Hotel does not provide Breakfast on the Day of Arrival as the Official Check-In Time is 1400 Hours. Many times in Hill Stations, Weather Changes are very Frequent. Expenses Incurred due to Traffic Jam, Road Blockage, Land Sliding, Snow Fall, Heavy Rain, etc. are to be Borned by the Guest. Indian Government Approved, Phote Identity Proof Along with the Address is Required at the Time of Check-In at the Hotel.